Buy One Get One FREE Open Jump! 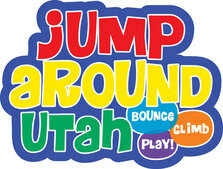 Jump Around Utah offers year round activities for children of all ages. We have a variety of bounce houses, obstacle course, jungle gym, and of course, our famous jumping pillow. We provide affordable fun. We pride ourselves on a clean and safe facility. Bring in your Utah Kids Club card for Buy One Get One FREE, 3 years and older, for open jump! Parents and spectators are FREE, Thanks Jump Around! !